Lock in a great price for Le Meridien Cyberport – rated 8.5 by recent guests! A particular attribute of this hotel is its great location. The area where Le Meridien hotel is located is quite and peaceful. Tasty breakfast, good room service, friendly staff! Helpful front desk staff. Clean Rooms. Beautiful sea view. The duty manager and the entire team were very kind and welcoming. The team were also helpful and so kind and didn’t save any chance to make such a great positive impression. The location is perfect if you require the surrounding business park. Rooms are bright and sea views are great in the morning. Bedrooms and bathrooms feel spacious, especially the good sized showers. Bed is comfortable Room service burger really hit the spot for a midnight snack. Only used hotel room, not restaurants or other facilities. Staff great. Free parking a nice bonus but not advertised or offered, needed to ask. Le Meridien Cyberport This rating is a reflection of how the property compares to the industry standard when it comes to price, facilities and services available. It's based on a self-evaluation by the property. Use this rating to help choose your stay! 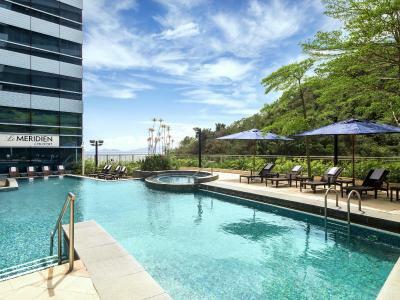 Offering panoramic views of the greenery and Telegraph Bay, Le Meridien Cyberport is an urban resort along the sea nestled in the Southside of Hong Kong Island, surrounded by the greenery backdrop of Pok Fu Lam Reservoir and Victoria Peak. The outdoor swimming pool, the 5 restaurants and bars and a convenient hourly shuttle bus service to Central Hong Kong make this hotel an ideal destination for holidays, staycations or a more relaxed business trip. Le Meridien Cyberport is 1.2 mi from Repulse Bay Beach and 2.5 mi from Macau Ferry Pier. All 170 effortlessly stylish designed rooms feature abundant sunlight through floor-to-ceiling windows with upscale amenities. Guests can stay connected with complimentary high-speed internet access and smartphone which offers unlimited 3G mobile internet data, unlimited local calls and international calls to 5 selected countries. Boutique-style meeting rooms with natural daylight, equipped with multimedia connectivity panels, intelligent conference and entertainment spaces provide a perfect setting for personalized meetings and events of all sizes. The versatile outdoor venues are ideal for social gatherings, weddings and creative events. Cantonese specialties and dim sum are served at Nam Fong restaurant, while unique sushi is offered at Umami restaurant. Alternative dining options include Podium wine bar and pastries at Prompt. When would you like to stay at Le Meridien Cyberport? House Rules Le Meridien Cyberport takes special requests – add in the next step! One older child or adult is charged HKD 495 per person per night in an extra bed. Le Meridien Cyberport accepts these cards and reserves the right to temporarily hold an amount prior to arrival. This property reserves the right to release the room after 16:00 on the day of check-in if there's no valid credit card provided for guarantee. Good hotel value for money, very friendly staff. Room was located on the 5th floor and facing the garden or outdoor area which provided limited privacy if the curtains were open since people outside could see the room Better to select a higher floor. Spacious rooms and more greenery. The hotel is getting dated. Some updates are due. The breakfast was incredible. Has been a long time ago I had such a good breakfast buffet. Both the Chinese side as well as the Western side was very well. With on top very friendly staff. Fairly expensive breakfast if you are gluten allergic as I am, and sad to pay so much and only end up with an espresso and a dry bread and some fruit. Either they should increase the gluten free choice or admit that the gluten free breakfast is not the same and charge less. Same also apply for the room service choice which is an absolute scandal. Came late and wanted some late night dining only to find out the lack of choice for a gluten allergic dining. Also would be great with a personal choice for my bathrobe which fitted a person half my height. I expect 5 star service when staying in 5 star hotels, and personalisation is an important part of that. Good Size rooms, high standard and fantastic breakfast for those who can. Shuttle bus to Hong Kong. Air from Air con wasn’t cool enough when we first got in. The staff at the reception was very kind and helpful. We arrived slightly earlier and they offered us free drinks. My personal request was handled very well. Appreciate it.